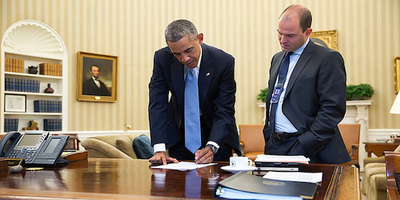 A Bipartisan Push to Undo Obama's UN Resolution? Obama Denies U.S. Was Behind the Anti-Israel UN Resolution - So What Happened? U.S. ambassador to the UN, Samantha Power, raises her hand to abstain from UN Security Council Res. 2334. Secretary of State John Kerry's emotional 73-minute speech on the Palestinian-Israeli peace process capped off an interesting week in U.S. diplomacy. His address was based on the fallout from the passage of United Nations Security Council (UNSC) Resolution 2334 a few days earlier, which the U.S. allowed to pass with its abstention. After the vote, U.S. ambassador to the UN, Samantha Power, tried threading the needle between implying the anti-Israel resolution was good for the Jewish state on one hand, and passionately rebuking the UN over its bias against Israel on the other—which curiously had nothing to do with the resolution she abstained from minutes earlier. Not to be outdone, after spending the bulk of his time criticizing Israel on what he perceived to be the damage caused by Israeli settlements across Israel's 1949 armistice line (also known as the Green Line), Secretary Kerry veered suddenly into a presentation of five principles that should guide future peace efforts between Palestinians and Israelis. Continuing the defensive sales pitch, Deputy National Security Advisor for Strategic Communications (and White House spin-master) Ben Rhodes has turned up on numerous domestic and foreign television networks. In pressing his case he vacillates between praising and defending the U.S. effort, and alternates between claims that the Obama administration's UN abstention was a major deal or much ado about nothing. With the UNSC resolution (UNSCR) coming mere hours from the start of both Christmas and Hanukkah, it sent reporters, politicians, and pundits alike into a tizzy, just as they were trying to recover from one of the more protracted and bruising U.S. election campaigns in memory. Many questions are left to ponder: What does the UN resolution mean for the peace process? Is this really a shift in U.S. policy? Was the White House behind the crafting or passing of the resolution? Why did this happen now? What can explain all of this? His unique accomplishment is how he packaged and sold the nuclear deal with Iran. As David Samuels, the profile's author put it: "The way in which most Americans have heard the story of the Iran deal presented... was largely manufactured for the purpose for selling the deal." According to Rhodes, "all these threads that the president's been spinning—and I mean that not in the press sense—for almost a decade, they kind of all converged around Iran." By creating a fake reality about the country, he was able to eliminate the fuss about their nuclear program, which, as Samuels observed, "would create the space for America to disentangle itself from its established system of alliances" and "would effectively begin the process of a large-scale disengagement from the Middle East." This should be eye-opening in the post-presidential election space when so many who supported the losing side of the electoral ballot are decrying "fake news" sites. Ben Rhodes was early to the party. In the spring of last year , legions of arms-control experts began popping up at think tanks and on social media, and then became key sources for hundreds of often-clueless reporters. "We created an echo chamber," he admitted, when I asked him to explain the onslaught of freshly minted experts cheerleading for the deal. "They were saying things that validated what we had given them to say." When I suggested that all this dark metafictional play seemed a bit removed from rational debate over America's future role in the world, Rhodes nodded. "In the absence of rational discourse, we are going to discourse the [expletive] out of this," he said. "We had test drives to know who was going to be able to carry our message effectively, and how to use outside groups like Ploughshares, the Iran Project and whomever else. So we knew the tactics that worked." He is proud of the way he sold the Iran deal. "We drove them crazy," he said of the deal's opponents. Amazingly, the profile's author readily admits, "Rhodes's passion seems to derive not from any investment in the technical specifics of sanctions or centrifuge arrays, or any particular optimism about the future course of Iranian politics and society... It is simply based on his own sense of urgency of radically reorienting American policy in the Middle East." As appalling as that all sounds, it was nevertheless how the U.S. made the most consequential foreign policy deal in perhaps half a century or more. It's how the debate was shaped, packaged, and sold to a willing national press. It's how the public consumed the idea, even as polling indicated they remained against the deal. Welcome to the real "fake news." Just as it was the case with the Iran deal, the Palestinian-Israeli peace process under the current president is a far cry from what most have heard in uncritical reporting. 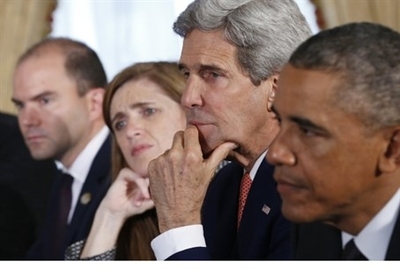 So what should one make of the Obama administration's recent moves against Israel? Contrary to the White House spin and their media parrots, the UN resolution will be taken for international law and it represents a seismic shift in decades of U.S. policy. The speeches and comments made by John Kerry, Samantha Power, and Ben Rhodes are all untethered from the UNSCR and serve to obfuscate and deceive, rather than clarify the U.S. position. To that end, Mr. Kerry's speech created a revisionist history to defend the administration's approach to the peace process generally, and the UNSCR specifically. Regardless of their statements—which have no legal validity—what matters is the resolution that will now be seen in some corners as international law. The UNSCR was either planned, advocated, shepherded—or most likely all three—through the UN by the Obama administration. The president's decision to make a dramatic move on the peace process was long in the coming but unfortunately for Team Obama, they gambled on world events and elections, both at home and abroad, hoping for different results and a more favorable context. For the peace process, the end result is a plan divorced from reality, brought forth by a president in the last gasps of his presidency, without the benefit of the utopian context that he hoped would support such an effort. Since reaching office, the Obama administration set out to lessen the American footprint abroad and especially in the Middle East. Part of that endeavor included trading traditional alliances for new ones that could bear the burden of the Middle East maladies. Such a dramatic shift in traditional U.S. foreign policy, and moreover, the very idea that it serves U.S. interests, is only possible by fundamentally misreading the Middle East. As such, in both rhetoric and practice, the Obama administration misunderstood what the core issues are in the peace process. They made critical errors that ultimately proved fatal to their pursuit of peace. That failure, coupled with the attendant inability to synthesize the lessons from previous peace attempts, explains why the current, parting effort at peace appears disjointed and flailing, long on fiery emotions but short on any new workable substance. In the end, it serves to bury rather than elevate the chances for a Palestinian-Israeli permanent status agreement.